10 Market is once again in the pages of Shrimp, Collards and Grits. Rick Slade, Chefs Tyler Slade, Ryan Weaver, and Fenix Nelson collaborated with SCG for a beautiful harvest entertaining spread. The chefs created the sumptuous appetizers, complete with the recipes for publication in the fall 2018 edition. 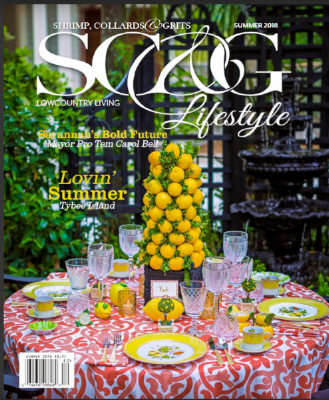 We are honored to be in the summer edition of Shrimp, Collards and Grits. In a five page spread, Editor-in-Chief Pat Branning highlights what we do best...bringing what she describes as "a culinary eclecticism" to Habersham and Beaufort, SC. Included is a selection of Chef Tyler's recipes along with beautiful photos of the plated dishes and the chef in action. It's available on newsstands and at 10 Market. Grab a copy and enjoy! And thank you for voting 3 Sisters Pizzeria Best Pizza in Beaufort! Our team of executive Chef Tyler Slade, his dad Rick, along with Chef de Cuisine Ryan Weaver and Chef Fenix Nelson are humbled by the community support that recognizes our commitment to consistently satisfying our guests.We are grateful that our supporters appreciate our focus on inventive, fresh dishes, served in an atmosphere that values personal connections and true Southern hospitality! Thank you Allie, for the great write up about Beaufort, Habersham, AND 10 Market! Hurricane and 3 Sisters Pizzeria opens in Habersham! 10 Market owners open 3 Sisters Pizzeria. Click here for the website. Voted Best Fine Dining Restaurant! We are very excited to let you know that, thanks to the support of our guests, 10 Market has been named best Fine Dining by the Beaufort Gazette's readers choice awards! We receive this award one year, to the day, from our opening so it feels like a huge achievement given the competition. Thanks to all of you for your patronage and support. We look forward to sharing many of Chef Tyler's meals with you in the future. 10 Market is in the news! Thank you, Molly Ingram, from the Island News for a great article. Thank you to Ashley Fahey for a great article in the Island Packet!